Among the heavily trafficked, wonderfully crafted exhibits on display at the 2013 Esri International User Conference Map Gallery, perhaps the most striking was the Urban Observatory. 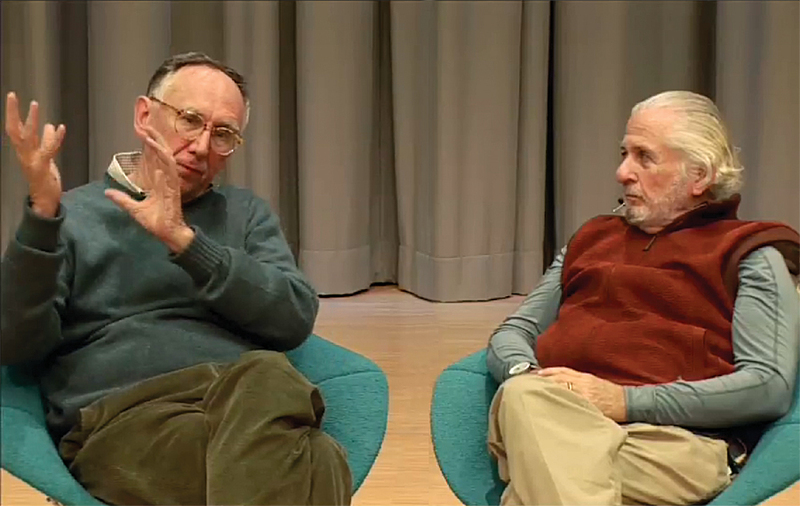 Jack Dangermond (left) and Richard Saul Wurman (right). The immersive experience took the ArcGIS location platform to new heights. People interacted with large screens and colorful maps to directly compare cities on numerous subjects, such as demographics, land use, infrastructure, and transportation. The Urban Observatory’s creator, Technology/Entertainment/ Design (TED) Conference founder Richard Saul Wurman, sought to build an experiential web application that would, as he put it, provide understanding through comparison and contrast to complex questions facing 21st-century life. Fellow creators Jon Kamen of @radical.media and Esri president Jack Dangermond also wanted to give attendees a visual context that gives way to meaning—and, most important, action. Yet simple is not necessarily reductive. In fact, it can be edifying. That’s how Wurman sees it. The simple phrase understanding precedes action was coined by Wurman years earlier in Kamen’s office. “I didn’t make a big deal of it. I didn’t think they were words coming down from Mount Olympus,” says Wurman. It’s the idea behind the Urban Observatory. It buoyed projects past (like the WWW Conference) and new (Wurman’s latest offering: 555 Conference 2015). It’s a principle for GIS professionals and anyone interested in maps. Esri’s own mantra, Understanding Our World, is woven of the same fabric: carefully analyzing and viewing information first to make better, more accurate decisions. What does this expression mean, anyway? Wurman has spent a lifetime mulling over how people can develop a language of performance in urban planning so that cities could consider unintended consequences. A perfect example—for years, as cities incur more traffic, they add more freeways and highways. Yet does that actually solve the problem? Or does it spur the purchase of more cars, which keeps freeways congested with more vehicles while consuming more fuel and generating more pollution? This is where geography and GIS help people develop a greater comprehension of issues before taking steps. Perhaps the best explanation of the expression is an exploration of how the principle manifests itself throughout Wurman’s work. A prime example is the Urban Observatory. The exhibit and website made their debut at the 2013 Esri User Conference. More than 16 cities contributed data, and the creative and technical forces at @radical.media and Esri built the first iteration of the exhibit using the latest software, hardware, fiber optics, custom kiosks, and high-quality monitors. ArcGIS Online allowed people at the exhibit to interact with datasets for each participating city. People used the Urban Observatory web application to easily compare cities on their own via a simple web browser. As an individual zoomed in to one digital city map, other city maps zoomed in parallel, revealing similarities and differences in density and distribution. For instance, what if you wanted to simultaneously view traffic density for Abu Dhabi and Paris? Or view vegetation in London and Tokyo? No problem. A mouse click and scroll was all that was needed. The Urban Observatory exhibit and application are continuing to evolve beyond the first prototype. From concept to creation, the goal has always been to provide a clear grasp of modern challenges facing today’s cities. And supplying that awareness to people, government, and business prior to making decisions was a central driver. Then there’s the WWW Conference. The event, hosted by Esri, was a type of “anticonference.” TED talks today have a polished and somewhat scripted approach that’s different from their initial iteration in 1984. The WWW Conference sought to achieve “intellectual jazz” through improvised conversation. The conference provided three days of dialog featuring dozens of celebrities and thought leaders. Wurman paired individuals together to spark conversation with a simple question, idea, or premise. Then he let the conversation evolve, naturally and organically, without rehearsal, preparation, or planning of any sort. Participants faced each other, not the stage. Dangermond, a keynote speaker, spoke with botanist and environmentalist Peter Raven. The two discussed biodiversity, sustainability, and climate change. Understanding—and geography, science, GIS, and mapping from human cells to space to the atom—were themes and topics of their conversation and of multiple speakers. The success of the WWW Conference served as the springboard for the 555 Conference, which is scheduled for the first quarter in 2015. Featuring five speakers in five cities located around the world, the conference will showcase experts sharing their predictions five years in the future. Each of the people making a prediction would be given as much assistance as desired to develop a presentation and take advantage of video, slides, data analysis, and visualization (including GIS). The forum for speakers would be spontaneous—not read or rehearsed but natural conversation backed up by extraordinary audiovisual elements. Then 555 will help launch the WWW2 Conference, which will build on its original concept of bringing in artists, entertainers, scientists, and others to talk about the predictions revealed at 555. The thought leaders and icons could then talk about the unintended consequences that could result from the five-year forecasts. Which takes us back to the beginning. Whether it’s Urban Observatory, 555, WWW2, or Wurman’s yet-to-be-named next creation, the axiom that understanding precedes action is at the core. And GIS, mapping, and geography are the underpinnings. For more information, contact Jesse Theodore, Esri.